Here's the 2nd-2 page layout that we made at my NEW Simply Scrappin' Club. I scraplifted this fabulous layout HERE by Nancy Kliewer. You can look at her SWEET blog HERE. Nancy made her pages before Stampin' Up! came out with the Scallop Edge Punch, so I can't even imagine how tricky it must have been for her to make the scalloped edges. By the way, "Papillion" is the name of the town we lived in in Nebraska. Think "million" when you pronounce "Papillion". I think it's the French word for "butterfly", but of course when they say it, it would sound so nice!! Here's how it looked before I added the photos, title & decorative elements. 2--So Saffron Dots DSP Sheets--taking note of the direction of the dots, cut 1 piece: 9x9.5 and cut 1 piece 9x10...IF for some reason, you don't cut them both going the same direction, do not despair, most of the dots will be covered by photos...it's okay...really!! 1--Multi Stripes DSP Sheet PLUS left over 1x12 piece from yesterday's pages. Extra Not In Kit: Whisper White 12 x12---trim 2--1 1/4 x 12 strips and trim 1--1 3/8 x12 strip. Next use Scallop Edge Punch (or scallop edge scissors) & scallop one edge on each of the three strips. 1. Attach trimmed So Saffron Dots DSP pieces to Riding Hood Red 12x12, 1 1/4 inches from the top. The 9x9.5 piece goes on the LEFT page...with the 9 inch edge completely flush with the right hand edge of the cardstock. The 9x10 piece goes on the RIGHT page...with the 9 inch edge completely flush with the left hand edge of the cardstock. 2. Attach Tangerine Tango Scalloped Border Strips to opposite outside edges of each page. The scalloped edge was approximately 1/8 of an inch from the edge making the straight edge approximately 1/2 inch from the edge. 3. Adhere 1x12 inch Multistripe DSP on top of the 1 3/8 x12 piece you have already scalloped. The scalloped edge will just barely peek out from behind the Multistripes DSP. Now attach this piece next to the Tangerine Tango Border Strip on the RIGHT hand page with the white scallops on the LEFT side of the Multistripe DSP. Now we come to the really "fun" part of the page. I know there must be a simpler way to accomplish this, but this is what I did to create the curve & have the scallops peeking out from underneath. Let me know if you know of the easier way! :) Just remember, you are only doing this for ONE scrapbook page, it's not like I'm asking you to do this on 100 pages! 6. Now you "get" to attach the scallop edge to the DSP. With the Tangerine Tango Floral DSP side showing, place a generous amount of your Dotto Adhesive along the ENTIRE CURVED EDGE...don't skimp! What I like about the Dotto Adhesive (aka Hermafix) is that it's strong enough to hold your scrapbook page elements together, but it's also not soooo sticky that you can't move things you have previously adhered...which comes in to play big time with putting this scallop edge down on the DSP. Starting at one edge at about the 3rd or 4th scallop in, start working your way around the curve. I think when I did it, I worked mainly from the back edge, putting the scallop down so I just couldn't see the DSP showing in the "valley". 12 inches will not cover the entire curve. That's why I had you cut a little bit into the other scallop strip. Once you've covered the entire curve. Trim off excess following the straight edge of the DSP and attach to the left side of the RIGHT page next to the Tangerine Tango Border Strip. See the photos below. Ta-Dah!! You did it!! Whew!! Now, isn't that just the cutest page ever?? Since this post is so ridiculously long, I thought I'd re-post the completed pages, so you don't have to scroll back up to the top. PS...Remember, you can adapt this layout to any colors & papers that you already have! Summer Picnic Coaster Caddy---really long post! I saw this FABULOUS idea on Becky Robert's Inking Idaho Blog . 1. Cover 4 coasters (from http://www.eclecticpaperie.com/ ) with the Designer Series Paper of your choice. I used my SNAIL adhesive to attach & then sanded the edges with a sanding block. 2. Use your Crop-A-Dile to punch four holes along each side about 1/2 inch in from the edge. 3. Lace ribbon of your choice through the holes. I used the now retired Old Olive Poly-Twill Ribbon. If you looked closely at Becky's caddy, her ribbons are laced through a little differently than mine...it's just the opposite, my outide lacing looks like her inside lacing & my inside lacing looks like her outside lacing. Just be sure to lace each one the same. 4. To connect the last coaster, fold in outside panels & lace it up with ribbons...it's a little tricky. I left mine untied during this process because I wanted a little give when I was assembling it. 5. Here's a top view after I laced the last 2 coasters together. 6. Here are the sides after I tied all the coasters together. 7. For the bottom, I put Tombow Multi-Purpose adhesive all around the edges & slid it down through the top. Then I put even more on the bottom to really make sure it was stuck! Well, I wasn't planning on putting any DSP on the bottom, but the Tombow stays pretty tacky even after it dries, so I cut a piece of DSP just a little bit bigger than the coaster & adhered it to the bottom & sanded the edges. 8. I created a divider with 2 coasters. I cut up the center of the coasters. I actually cut out a small sliver of the coaster so that they would fit together better. Can you see that in the first picture? It wasn't just one cut, I cut out a little bit. 9. I put Tombow Multi-Purpose Adhesive on the bottom edges of the divider & slid it down to form 4 compartments. 10. Now comes the fun part...Decorating!! I used the new Filigree Brads, but used Bashful Blue Brads in the centers instead of the silver ones that came with it.. I used some Red Rhinestone Brads to add a little bling. I used the smaller flowers from the Filigree Brads and inserted Old Olive Brads into the centers. 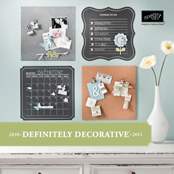 Although I love the idea of the calendar & write on/wipe off board on Becky's caddy, I already have a calendar in my Stamp Room where I'll be using this & the post-it notes will work for a message area. I thought I'd put two of my favorite verses on it, so that I'd see them everytime I sat at my Stamp Table! I used the Write Me a Memory 2 Font CD...love it! Sorry for the extremely long post today. I hope all the photos will help you make you very own coaster caddy. I think this would be a great Christmas gift & fill it with pens, pencils, etc. PS...Stampin' Up! 's new Online Ordering 24/7 kicked off today!! So when you need something in middle of the night or any time of the day, just go to www.erinblair.stampinup.net & click on "Shop Now" button at the to of each page. I'll give you more info on this sensational opportunity tomorrow! A Tip from the Top! Okay, so I'm NO-WHERE near the TOP of anything, but I thought the title was catchy! Since there is no way I will be able to post anything nearly as cool as the Vinyl DSP Bag I just made, I thought I would post an interesting idea for you. Ready??? Are you sitting down?? Let's go! As most of you know, Stampin' Up! 's stamp sets come so that you GET to put them together. THANKFULLY, Stampin' Up! has started die-cutting the new stamps, so step one of the process has been taken care of for you. After you have cut out or popped out your new stamp, you then adhere it on the wood block where-ever you want! That way you can mount it to the side or bottom, so that when you go to stamp the image, you can see right where to put it. NO this part isn't my tip from the top...I'm getting there!! As you can clearly see, I also mounted the words to the far left so that when I go to stamp it I can see where I want to stamp it. Here's what they look like in the box...ooh...ahh! I know isn't this like the best idea since...die cut stamps?? They should have just made this a double mounted stamp set to begin with! Bella Rose Treat Holder...CASEing myself...again! Did you know that TODAY, Monday, August 11th, is the FIRST day you can start ordering from the BRAND NEW Stampin' Up! 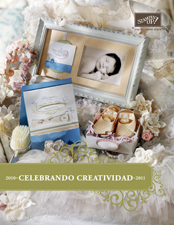 Idea Book & Catalog?? What? You don't have a catalog? How can that be? Just shoot me an email & I'll hook you up! YOU MUST HAVE A CATALOG!! Life will not continue on it's proper course if you do not have this catalog! **I've revised how I'm getting my catalogs from me to you: You can get one for FREE by being a member of one of my clubs, you can get one for FREE by hosting a workshop, you can get one for FREE by coming to my NEW Catalog Open House in a few weeks (I haven't set the date just yet), OR if you live outside of the greater Oklahoma City metro area, I will mail you one for the cost of shipping...$4.80 for priority shipping. 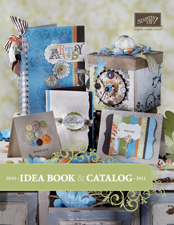 I ordered TONS of catalogs & I've made a goal to get these FABULOUS catalogs out of my house & into your hands ASAP!! With that said, here is a little project that I made for my Control Freak Swap group a few months ago & then I've posted my CASE using the NEW Bella Rose DSP that is available for purchase RIGHT NOW!! Directions: 1. Start with 6x6 square of your choice of DSP (depending on what you are wrapping your dimensions might be different, but with this size, you can get four wrappers out of one sheet of DSP). 2. Place a 6 inch piece of Sticky Strip down the length of one of the sides very close to edge, and about a 2-3 inch piece of Sticky Strip in the middle on the bottom edge. Place item to be wrapped in the center of the DSP. Remove the red backing from the 6 inch piece of Sticky Strip & wrap both sides of DSP around item & press firmly. *You can also use scoring blade for crisper egdes. 3. Remove item. Now you basically have a flat tube. Remove backing from piece of Sticky Strip that was at the bottom & press firmly. Use your crimper to crimp about 1/2 -3/4 inch up from bottom...it helps Sticky Strip to stick better and it's cute! 4. Punch Horizontal Punch about 1/4 to 1/2 inch down from the top...going through both front & back layers. Place a piece of ribbon (approx 24 inches) through both front & back holes & center it with equal lengths of ribbon on both sides. 5. Place item down through opening. Ribbon should be going down holder as item is being inserted & pushed down. 6. After pushing item all the way down. Tie ends of ribbon into a bow. 7. To access your treat, simply pull up on ribbon bow! Ta-Dah! !